Reader António Fangueiro was kind enough to send photos of open, oared fishing boats which are launched through surf in Kerala, India. Visible similarities include great amounts of sheer and rocker, substantial overhangs, high ends, and general suitability for the dangers of launching and landing through surf, although the xavega appears to have finer lines and to be more extreme in general. The final photo of the Portuguese boats seems to show a sailing rig being loaded aboard, while oddly-shaped oars appear to be the only form of propulsion for the Indian vessel. Of course, one would not expect to see Indian craft being launched by cattle as they are in Portugal. India's substantial manpower resources make up the difference. Thanks again to António for this interesting comparison. 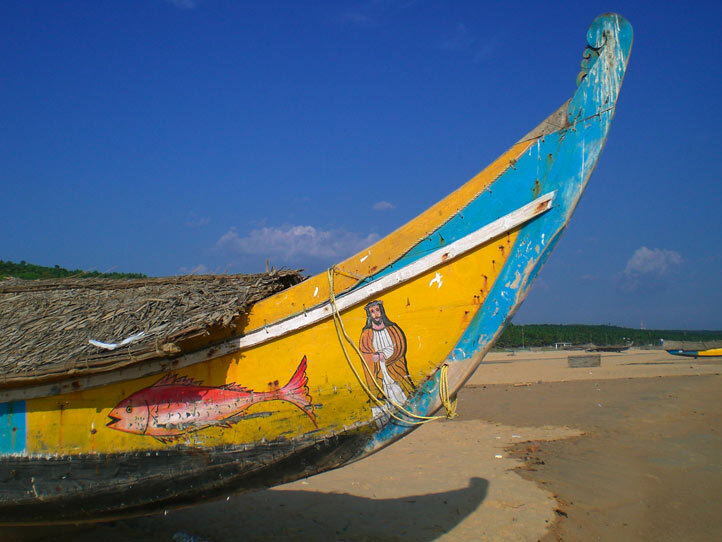 The Indian boat looks like a canoe and the arte xavega looks like a dory. Of couse it's the arte xavega I find most attractive. I've never seen either of these boats before (which is why I peruse your research). 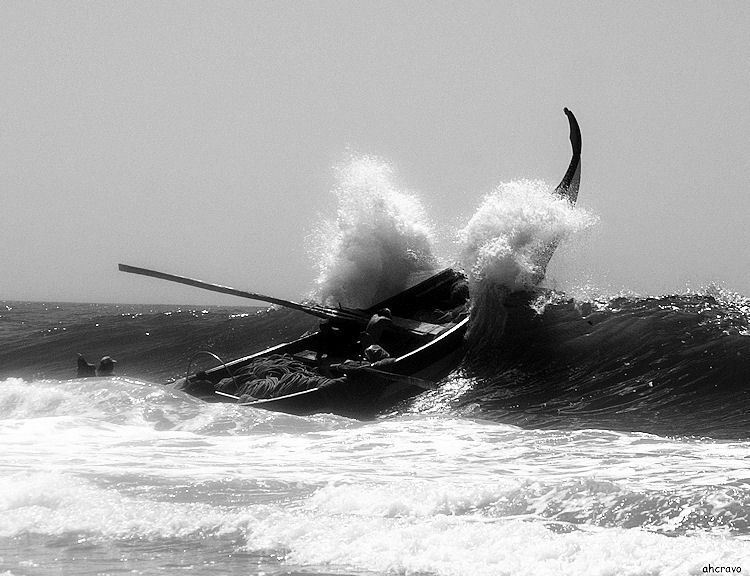 One more thing I noticed: the xavega is going out through the surf without any visible propulsion -- no oars in use. I wonder how. Thanks for publishing some material on this comparison. 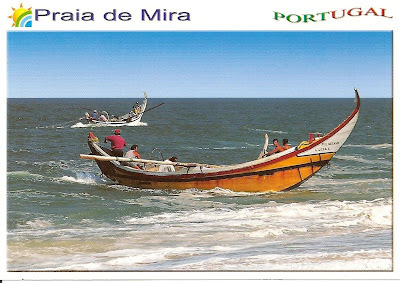 In Portugal, the way to "put" the boat into the surf is by manpower, waiting the right and favourable wave movement. 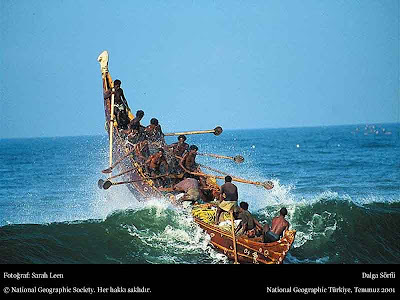 Then immediately the men on board pull the massive oars to get out of the wave breaking as quick as possible. These boats don´t use any form of masts/sails. In the past they were huge boats, with 4 massive oars, and 30-40 men onboard. Nowadays they are only the smaller type, with 2 oars and already with outboard engines adapted. 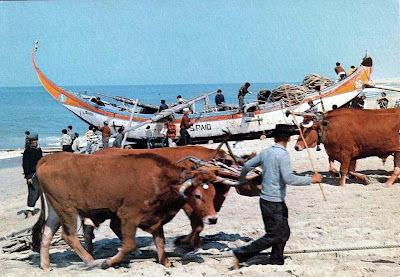 The bulls are used to pull the boats into the sand. On the Kerala examples, it´s very interesting to note that the boats are not carvel built. They are sewn, as tradition of Indian coasts. On your site you delineate a history of the Barco do Mar that takes it back to Mesopotamia. It is probable that while the Barco do Mar traveled west with the Mediterranean peoples the type also traveled east – just a little distance – to India. These boats, as with many of the Portuguese flat-bottomed types clearly have ancient middle eastern roots. They have a deep and wonderful history! It is also possible that the types did migrate from India to the Middle East and then on to Europe. That is the path that coinage did take as well. Indus civilization predates Ur itself. Portuguese brought this and other technologies of the time, to India, after being the first westerns to travel to this country by sea in the XVI century! 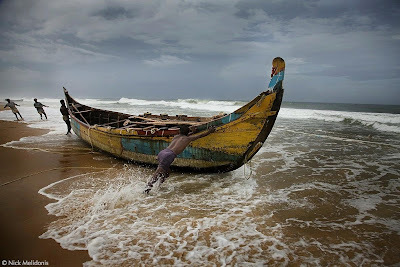 The XVI century is very recent,in terms of the seafaring history of India and Southeast Asia. Those people have been boat building for thousands of years.The Middle east,the Mediterranium and Western Europe adopted all that technology.Is well proven. And I speak as a Portuguese. If you look at the last picture you can see one of the larger boast with an inscription of “S. Paio”. This is the patron Saint of the town of Torreira. A closer look will reveal the logs under the boat as they prepare for another trip out. The wooden object hanging out the side is one of the oars and not a mast. The bulls in the front of the picture are pulling in the net.